The history of land rights in Colombia is a centuries-old tale of colonialism, highly concentrated land ownership and unsuccessful agrarian reforms. Fifty years of civil strife have left vast sections of the country’s land undocumented, vulnerable to land record manipulation and outright lawlessness. Under the landmark peace agreement, the Government of Colombia has committed to addressing the land issues that have so often been at the heart of the nation’s conflicts – by formalizing property rights across the country, organizing the national registry and recovering lands that belong to the state. In a warehouse on the outskirts of the capital, the nation’s property registry authority—the Superintendence of Notary and Registry (SNR)—stores over 80,000 paper-based property ledgers, some dating as far back as the 18th century. In 2015, the Constitutional Court ordered the government to restore, transcribe, digitize and conserve the records, seeking to modernize the disorganized and unreliable land administration system that had persisted for generations. In addition to organizing the historical documents, the court ordered the SNR to determine how much land had been acquired irregularly (without formal documentation) and continued to be held unofficially. A year-long investigation showed that at least 30 percent of the nation’s territory—some 5 million hectares of land—was acquired irregularly. Now, in the post-conflict era, the national government has pushed rural land reform to the forefront of national dialogue by creating a new land administration authority, the National Land Agency. The agency is mandated to begin an ambitious land formalization campaign—in response to the fact that six out of every ten parcels in Colombia are informally owned—and coordinate rural development strategies with its sister agencies: the National Development Agency and the Agency for Territorial Renovation. As the three agencies maneuver in unprecedented ways to ensure that sustainable investments reflect an integrated development approach, USAID, through its Land and Rural Development Program, plays a key role as facilitator. On its surface, USAID’s program acts as a conduit between national, regional and municipal administrations, improving intergovernmental coordination and making it easier for sub-national government agencies to mobilize domestic resources to address land issues and rural development. At a deeper level, the program is fostering critical public policy and governance changes that are improving Colombia’s land regulatory framework. In partnership with the National Land Agency and the National Planning Department, USAID is spearheading a high-profile land formalization pilot in the municipality of Ovejas, a priority municipality in the nation’s post-conflict environment that was devastated by two decades of guerrilla and paramilitary violence. The pilot—which will soon title 3,000 parcels—is streamlining the collection and processing of property and cadastral information in order to reduce costs and provide government land agencies with integrated and reliable land data. The government is monitoring the Ovejas pilot carefully as it looks to learn about the most promising technologies and approaches as it prepares to undertake its own national land titling campaign. “In the past, the government formalized property in an absolutely isolated manner. This pilot changes the way we do things in rural land administration. In Ovejas, we are focused on resolving all types of land conflicts, from parcel to parcel. The strategy is new, it is massive and it requires a higher degree of institutional coordination than we have ever seen,” explains Juliana Cortés, director of land tenure at the National Land Agency. 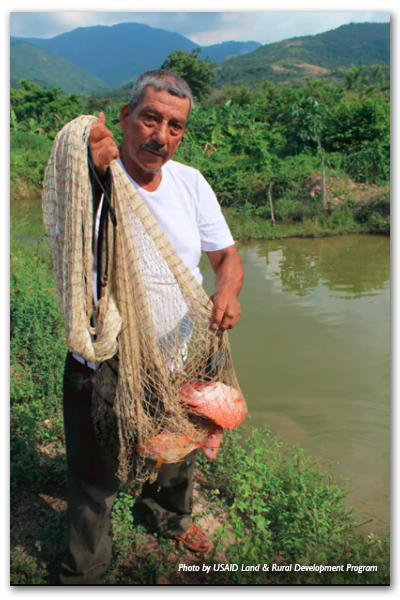 The Ovejas pilot is part of the government strategy to move away from a demand-driven land administration policy to one in which the government assumes the cost of first-time formalization. By doing so, it will alleviate major time and cost burdens that prevent most low-income rural landholders from seeking a valid title. Once a property is registered, future title transfers will be much less time and cost intensive. To get to this point, the USAID program has worked for nearly five years on creating an environment where government entities are more willing to share information and coordinate efforts to strengthen land tenure, improve land use and catalyze rural development. “By framing land tenure with institutional strengthening, USAID is testing a new approach that no longer patches holes along the way. 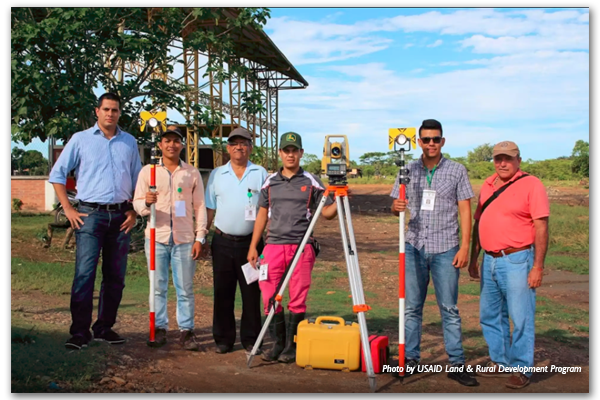 We believe the Colombian government to be capable of land administration—we merely support them in certain activities and put effective tools in their hands in order to ease the process,” explains Marcela Chaves, USAID/Colombia’s land tenure expert. At the core of strengthening Colombia’s land institutions is access to information and the use of IT systems to manage and ultimately protect the country’s land and property data. The information gathered through the pilot is stored in a central database that merges former data collection systems, and is shared with the property registry authority. At the same time, USAID is assisting in the digitization of over four million land documents, which represent one-fifth of the country’s area. “One of our biggest challenges in formalizing land is the ability to count on and trust the information that we have. What we have now is basic data that is not specific enough to make clear decisions in the public policy forum,” says Cortés. Better land tenure policies and systems are already catalyzing rural development. In the new, land-conscious Colombia, municipalities are prioritizing titling public properties, such as schools, to stimulate rural investments with national funding. Beyond land tenure, this innovative USAID program is using its rapport with government entities to broker public-private partnerships, in which more than half of the funds are from the domestic government. Making domestic public entities—rather than USAID—the face of development continues to increases the public’s confidence in their leaders and institutions. In a country long wracked by corruption and war, a little bit of confidence goes a long way.